The 101 Vest for Women is the perfect garment for when you need to travel light and still have convenient access to all your essentials. 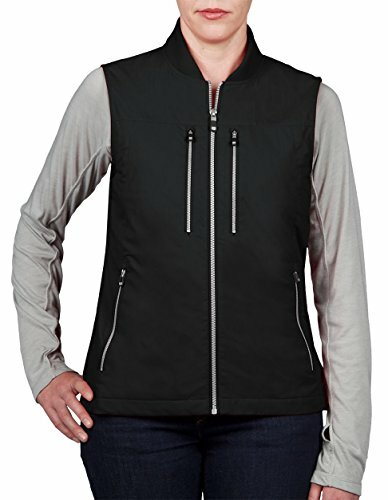 The lightweight, cotton/nylon blend, machine washable vest features 9 pockets. Use the PadPocket to carry your iPad or tablet and carry items you need to access quickly in the two exterior chest pockets. Keep important info at your fingertips with the travel documents pocket and never lose your keys again with the detachable and extendable keychain inside the right hand warmer pocket. The 101 Vest even has an elastic loop to keep your water bottle upright so you always stay hydrated. TRAVEL CLOTHING - this garment carries your travel necessities so your carry-on baggage can be used for clothing, With everything organized securely on your person, TSA check-ins are a breeze. If you have any questions about this product by SCOTTeVEST, contact us by completing and submitting the form below. If you are looking for a specif part number, please include it with your message.